Great for travel lovers or meditators, Sandalwood Fair Trade incense. Perfected for gifting, they are wrapped in a fabric cylinder with a twisted paper closure. The traditionally crafted bundle of incense comes with approximately 30 sticks and includes a wood holder. Each stick burns for approximately 1 hour. 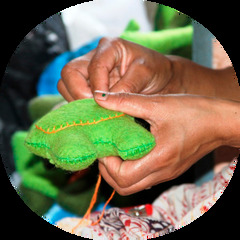 Each purchase supports artisans in Tibet with fair-paying jobs that allow them to preserve their traditional crafting culture, improve their living conditions, and uplift their communities.